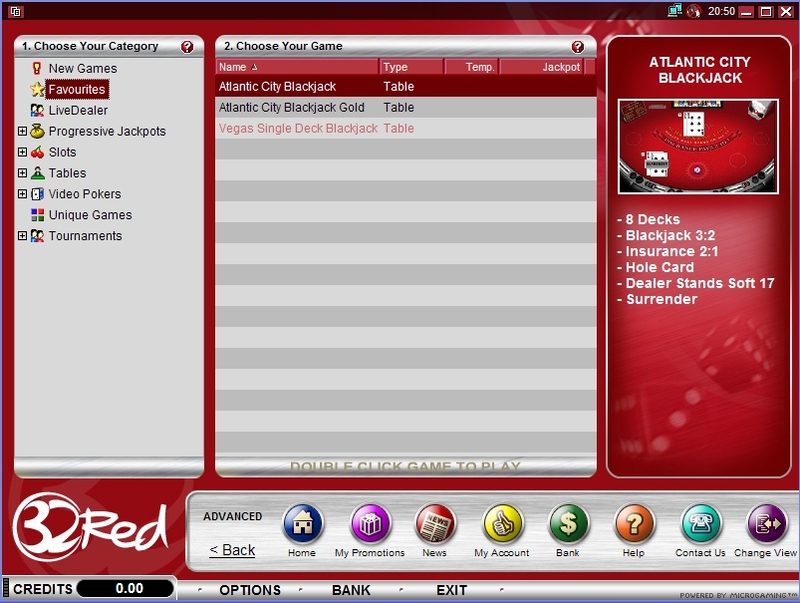 Online casinos don’t come much bigger than 32Red Casino. Although they may have recently been bought out by the same group who own Unibet, this is still one of the most trusted, respected, and popular online casinos on the net. 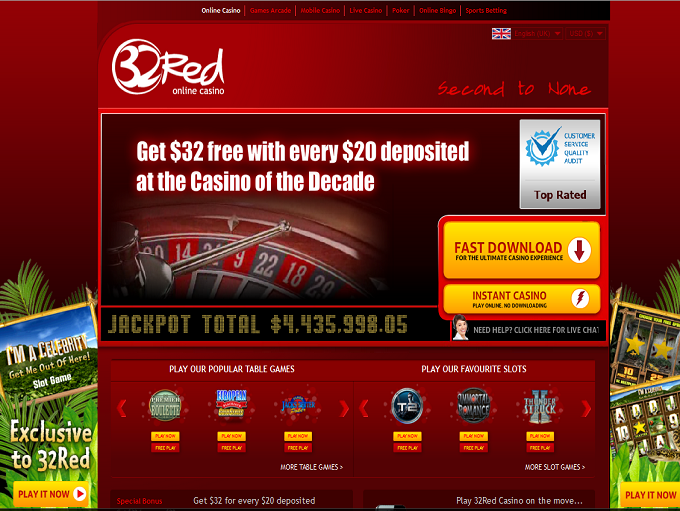 32Red Casino offers downloadable, instant play and mobile gaming to their users, and in a variety of languages which include English, Chinese, French, German, Greek, Italian, Japanese, Norwegian, Polish, Russian, Spanish, and Swedish. They have the history and licenses to back up their claim as one of the biggest casinos, too, having launched in 2001, and being licensed out of Gibraltar and the UK. 32Red Casino is eCOGRA certified as a safe place to play your favourite games. Players can deposit into their 32Red Casino accounts using ECO, EntroPay, Maestro, MasterCard, Neteller, PayPal, Paysafecard, Skrill, VISA, VISA Debit, VISA Electron and wire transfers, using US dollars, UK pounds sterling, euros, Australian dollars, and Japanese yen. If you have any questions feel free to contact them via a variety of toll-free telephone numbers, instant chat, e-mail or even Skype. 32Red Casino offers £32 free for every £20 a new player deposits at the casino, valid up to £160 in all. Players can also join in a range of current promotions and bonuses, including Dish of the Day, Ruby Tuesday, Red Ruby Rewards, and Red Letter Day promos. They have a loyalty bonus programme which is second to none. Known as Club Rouge, 32Red’s loyalty bonus club can see players pocket rubies for their wagers, and these points can be converted into real money bonuses at the casino. 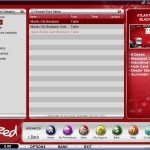 32Red Casino offers a decent selection of games, the vast majority of which are provided by Microgaming. Admittedly, there are more games in their downloadable software suite then their mobile and instant play casino domains. Some of the games you can expect to find at 32Red Casino include feature titles, slots, live casino games, roulette, blackjack, baccarat, various table poker games, scratch cards, keno, sic bo and more. 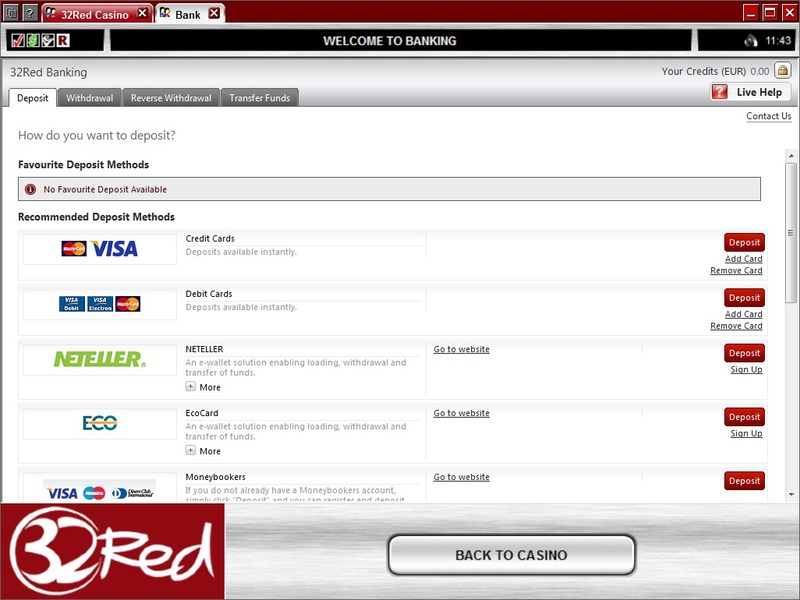 You can also pop into their poker, bingo, and sportsbook websites with your 32Red Casino account. If you love top slots, then try your hand at Ant & Dec’s Saturday Night Takeaway, Fruit vs. Candy, Pollen Party, Thunderstruck II, Immortal Romance, Gold Factory, Lost Vegas, Mega Moolah, Game of Thrones, Lucky Leprechaun, and Dragonz, today. Other top slots at this casino include Emperor of the Sea, Classic 243, Mermaid’s Millions, Jurassic Park, Huangdi: The Yellow Emperor, Life of Riches, Untamed Giant Panda, and Secret Romance. The following countries are restricted at this casino: Belgium, Denmark, Spain, France, French Republic, Greece, Hong Kong, Turkey, United States, United States Virgin Islands, South Africa.